Readers have asked me for a Vanilla Cake or Cupcake recipe that isn’t complicated and a lot of steps. This recipe is easy to make and not so time consuming. 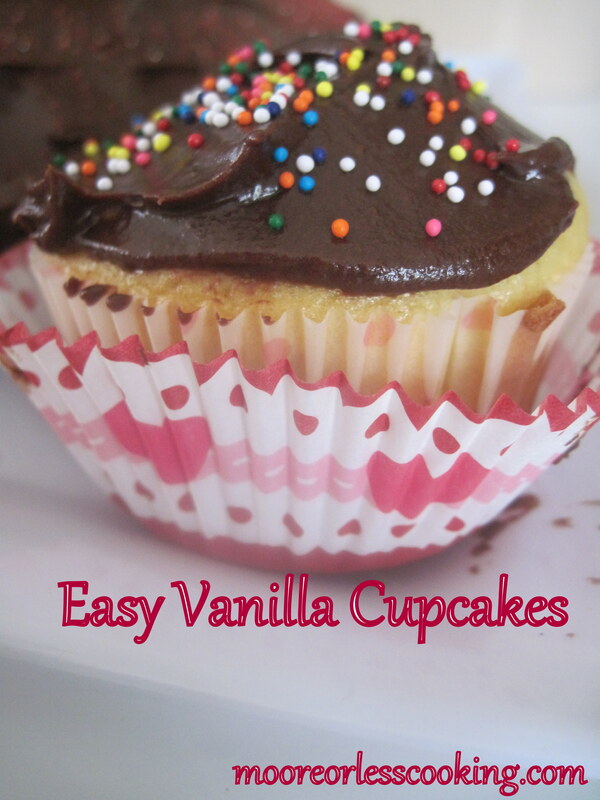 My kids love Vanilla Cupcakes with Chocolate frosting! So I thought they would love a Valentine’s Cupcake! This is such an easy recipe and you can choose what kind of frosting you would like, the flavors are endless. My kids love colored sprinkles, use whatever you have to make them look festive. This is such an easy recipe but can be made individual with a slight twist or a special icing. For a nice twist, can add frozen fruit just before it goes into the oven and it will make the flavor and color pop!. Line muffin cups with papers. Who doesn’t love cupcakes? These look awesome! Love your pretty little cupcakes and they do seem to easy! !